From I-80, take Exit 120, Clearfield, to stop sign. Turn left onto Rt. 879 East towards Karthaus. Travel 12 miles to Frenchville. Arriving in Frenchville you will go past a closed gas station on the right and then Susquehanna Rural Free Clinic. Go 1/8 miles past the Free Clinic and turn RIGHT onto VFW Rd. (our sign is there). The road will be paved and then turn to dirt – stay on that road for 1.5 miles to stop sign. Turn RIGHT. 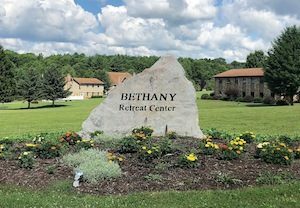 Go 100 yards and turn RIGHT into paved driveway at large Bethany Retreat Center rock. 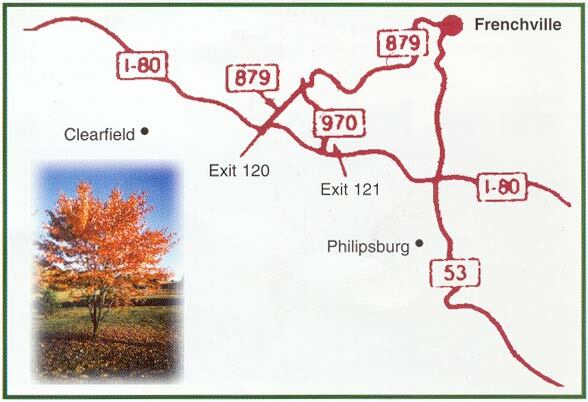 Route 322 to Philipsburg to Route 53 North and travel 4 miles. At Pacific Pride Gas Station/Nittany Minit Mart, turn LEFT onto Deer Creek Rd. Go 5 miles to first stop sign. Go straight. Go 7 miles to stop sign and “T”, turn RIGHT onto Rt. 879 in Frenchville. Go 1/8 mile past the Free Clinic and turn RIGHT onto VFW Rd. (Our sign is there). The road will be paved and then turn to dirt – stay on that road for 1.5 miles to stop sign. Take I-99 to Bald Eagle Exit #52. At stop sign turn LEFT onto Route 350. At traffic light go STRAIGHT onto Route 350 North. Go 13 miles to Philipsburg. Coming into Philipsburg, at the first traffic light go STRAIGHT and you will be on Route 322W (for a couple of blocks). At the next traffic light go STRAIGHT. Come to traffic light and turn RIGHT (Sheetz on the right) onto Route 53 North. Stay on Route 53N for about 4.5 miles and you will see a Pacific Pride gas station/Nittany Minit Mart on the right. Make a LEFT onto Deer Creek Road. Go 4 miles to stop sign. Go STRAIGHT. Go about 8 miles to next stop sign and make a RIGHT onto 879 towards Frenchville. Go about 2 miles. Arriving in Frenchville you will go past a closed gas station on the right and then the Susquehanna Rural Free Clinic. Go 1/8 mile past the Free Clinic and turn RIGHT onto VFW Road. (Our sign is there.) The road will be paved then turn to dirt – stay on that road for 1.5 miles come to stop sign. Make a RIGHT. Go 100 yards and turn RIGHT at the large Bethany Retreat Center rock and into the driveway. Take I-80 West to Exit 133, Kylertown. Come to traffic light and go STRAIGHT through. You will be on Rolling Stone Road. Continue on this road for 10 miles. You will come to a “Y” in the road. VEER LEFT and come to a stop sign. Turn LEFT onto Route 879 and go about 2 miles. Turn LEFT onto VFW Road and it will turn to dirt. Go 1.5 miles to stop sign, turn RIGHT go about 50 yards and turn RIGHT into paved driveway.